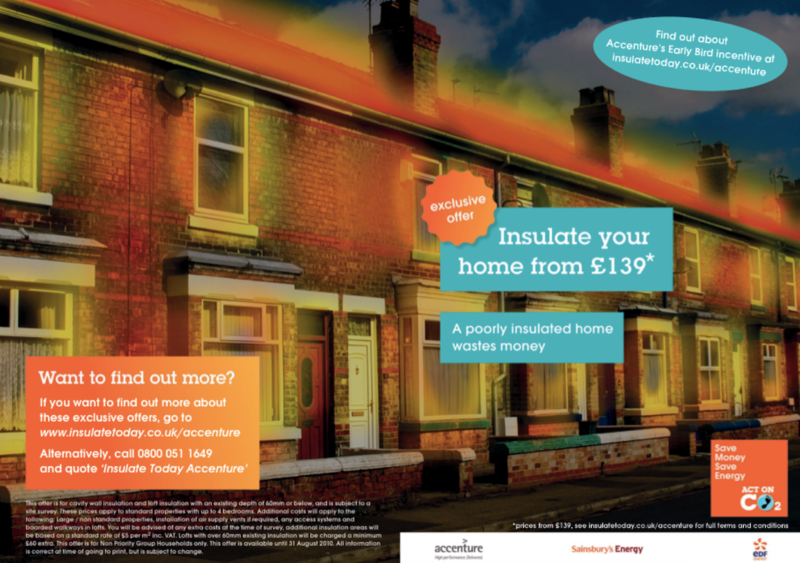 In 2010, we were funded by the Department of Energy and Climate Change to create Insulate Today, a cross-sector collaboration designed to make it easier, cheaper and more appealing for a quarter of a million employees to insulate their homes. Installing loft insulation is a straightforward way of saving energy and money but our research showed that it was ‘out of sight and out of mind’. It simply wasn’t on the priority list for householders and when prompted to consider it they assumed it would be very expensive (costing £1000s) and a major cause of disruption and hassle. Existing schemes to drive take-up of insulation had been effective in delivering low cost installations but had done so in a behind the scenes way that had failed to have any knock on benefits for awareness or demand. We worked with 4 major UK employers (Accenture, Aviva, HSBC and Sainsbury’s) as well as EDF Energy and the Energy Saving Trust. The campaign ran for a period of 4 weeks, reaching 251,000 employees. A post campaign survey demonstrated that this was a very effective way of reaching employees, with 51% or respondents aware of the activity. Response levels were also impressive. 7.5% of those exposed to the campaign visited the website, with 0.64% going on to book a survey of their loft. This put the programme in the top 10% of Energy Saving Trust advice centre campaigns. The EST calculated that the insulation would lead to savings of 14,000 tonnes of CO2 over its lifetime.